1 double bedroom, 2 single bedrooms, 2 bathrooms, underfloor heating, free high-speed Internet connection, Wi-Fi / Wi-Fi. Large balcony on the south and east side with rattan lounge and dining table, sun loungers. Only permitted to Non smoking, no pets. Comfortable, 4.5 room duplex apartment on the 1st Floor for max. 4 persons, in multi-family chalet in an idyllic location on the sunny slope of Grindelwald. On the ground floor are Studio East and Studio West. 3 * star standard apartments according to apartment classification Swiss Tourism Association. Very quiet. central and sunny location. Fantastic views of the Eiger North Face, Wetterhorn, Mettenberg, Schreckhorn, Finsteraarhorn and the glaciers. Only 5 -10 minutes walk above the train station Grindelwald, Jungfraubahn train station Jungfraujoch 'Top of Europe' and to Interlaken. The village center with the shopping center 'Eiger +' and the sports center with indoor pool, restaurants, are within a few minutes walk from the chalet. In winter: 4x4 wheel drive and snow chains are urgently needed to drive up to the chalet! The apartments have a free high-speed Internet connection, free Wi-Fi, Wi-Fi, dishwasher, large flat-screen TV, new health mattresses. 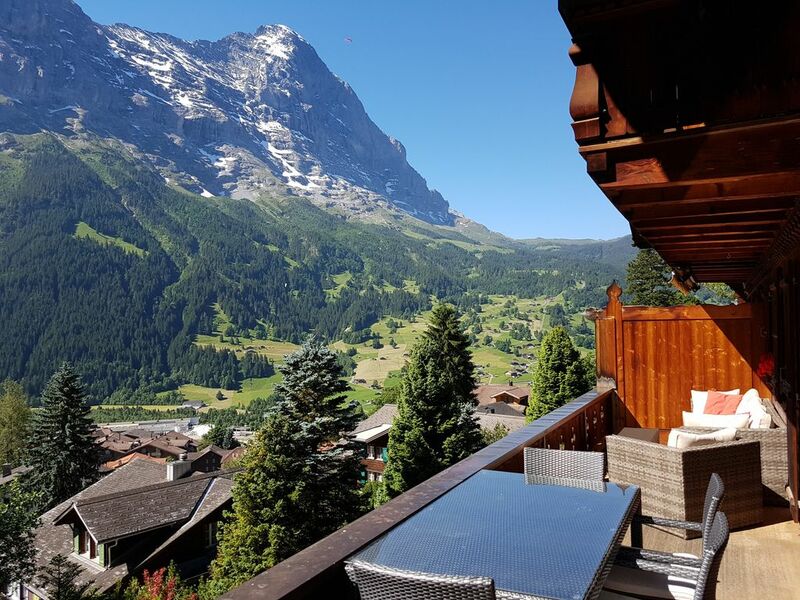 All apartments have a beautifully furnished terrace / balcony with a large comfortable Rattansitzgruppe and dining table, deck chairs and beautiful views of the Eiger North Face and the glacier. Washer and dryer with coins in the house. Non smoking apartments, pets not allowed. This property is simply breathtaking. You could not ask for a better view! Especially on the amazing balcony. This was truly our home away from home. We loved waking up to the beautiful views of the mountains, and we had a short walk to town. Ruth was so responsive and helpful, and we had everything we needed for a comfortable stay. Fabulous views and location in Grindelwald!!! We were on a photo shoot for "Partner Yoga" and the backdrop of this beautiful village and the Alps provided stunning photos! The apartment was very clean and we appreciated the well equipped kitchen and amenities. The deck offers a majestic view of the Alps and the views are so much better than online photos. Thank you Ruth Jauch and Erica! We loved our stay! A beautiful cottage, we got the apartment with 3 bed rooms, 2 bathrooms, kitichen and a living room. The balcony view is wonderful to the mountain and beautiful scenery. Ruth the owner is very helpful and very sweet. She welcomed us and helped us a lot. I really recommend if you want a quite place to book it. The main street is about 2 minutes drive and maybe 5 minutes walking down the hell. Great flat with stunning views. The flat is well equipped and comfortable with great veranda. We had a most wonderful experience staying at Chalet Moosrain. Everything is perfect here. We love this Chalet so much. The view, the location, and the hostess is perfect. My kids were screaming when they first walked into the Chalet. The view from the balcony is stunning. We have enjoyed this Chalet so much. Beautiful property with scenic mountains all around. Thoroughly enjoyed our stay. Thanks so much Ruth for your help and hospitality. Very quiet and centrally located. Approximately 8 -12 minutes walk above Grindelwald station, shopping center "Eiger +" and village center. Ideal apartment for guests arriving without car or by train. Local bus for free with guest card you will receive upon arrival at the chalet. Car access in winter: 4 x 4 wheel drive and snow chains are urgently needed! Bettwäsche; Bade-und Handtücher sind im Mietpreis inbegriffen. Max. 4 Personen + 1 Kind bis 4 Jahre (Kinderbett vorhanden) Nur an Nichtraucher, keine Haustiere. Anreisezeit: 16:00 - 18:30 Zufahrt im Winter: Bei schneebedeckter Strasse sind 4 Rad Antrieb und Schneeketten am Auto erforderlich! all laundry included. Check-in time: 4pm to 6.30pm non Smoking apartment During Winter season 4 weel drive and chains necessary by snow and ice on the road! Guests can be picked up by arrival from the train station or car park and taken to the chalet during the winter season!